Publisher’s Summary: Mackenzie and Amy were best friends. Until Amy was brutally murdered. Kathleen Peacock's thrilling novel is the first in the Hemlock trilogy, a spellbinding urban fantasy series filled with provocative questions about prejudice, trust, lies, and love. 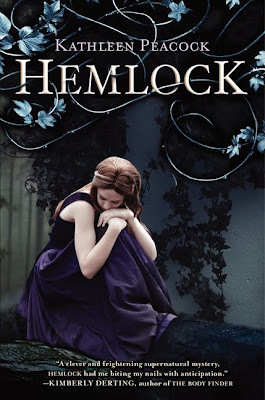 My take: Even though I’ve been getting mixed opinions about Hemlock, I started reading it with an open mind and discovered that I actually really liked it! I was immediately drawn to the story from the very first page. One of the things I loved about Hemlock is that it’s not only an Urban Fantasy but also a murder mystery! I loved how I was swept into all the crazy left and right story twists while Mackenzie was investigating who killed her best friend! Twits like… Who is a werewolf? What really happened the night Amy died? Who, if anyone, should Mackenzie trust? There is one surprise after another all the way through Hemlock and the end even has a pretty awesome twist!!! The characters in Hemlock are all pretty likable. Considering everything that Mackenzie had to go through from her past and now present…she is one tough chick! So, even though I’d like to tell you more about the other characters I liked, I think doing that would spoil the story for you. Because, while reading Hemlock, I found that I wanted to like each of the characters, but at the same time I wasn’t really sure if I could or should trust ANY of them. And as far as the romance goes, I of course fell for the “other” guy! If you like a book with werewolves and/or a murder mystery then you should totally read this one! It’s really good. So glad to hear you liked this one!! I actually had heard anything about it before this, good or bad---but I definitely had high hopes for it! Great review!! I am going to be reading this one soon. I am really looking forward to it! You have gotten me more excited for it. I'll be starting Hemlock very soon. I'm excited to dig in and see what I think. I've really gotten into mysteries lately, more than the romance. Great review, Mindy, I'm glad you enjoyed Hemlock! I want to read this SO bad! It's totally up there on my TBR list! So glad that you liked it. Yeah :) It was one of the better ones this year. Really glad you liked this one Mindy :) !! I definitely want to read this one now .. Fabulous review !! I love when there is a mystery thrown into a paranormal read. Makes it so much more exciting.